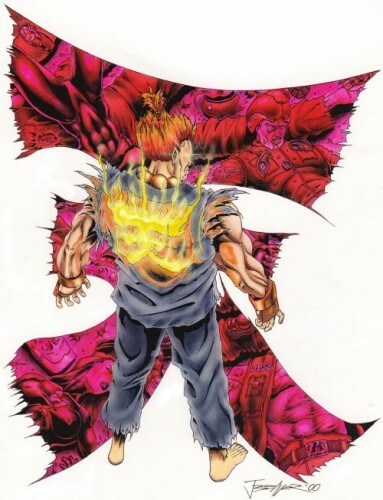 He's called Akuma in the U.S., but he's known as Gouki (which is his real name) in Japan. As you can see, he just finished wiping the floor with a lot of people stupid enough to get in his way. Is everything in here accurate? Nope. That's because I drew this before two things: one, I knew of Tiamat's FAQ and before I had even been on the internet. Funny thing about Street Fighter games (and most fighting games in general) is that most of the really important information is to be found everywhere except for the game. No, that symbol doesn't appear as flame on his back, but I thought that it looked cooler back then. Plus, I needed something to airbrush or it'd look lazy. This is one of those pics that I'm really thinking of redrawing someday.